The following tour encompasses both natural as well as religious and cultural excursion. 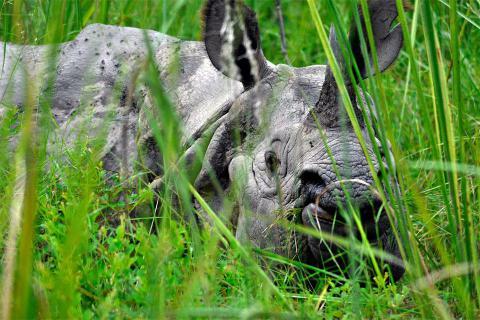 Kathmandu valley and Chitwan National Park both carry importance at an international level. Wrapped in the ever bustling present day the Kathmandu valley carries a religious as well as cultural significance on modern day Nepal. This religious sentiment can be seen being shared in both Kathmandu and Patan City. Both cities are heavily influenced by the Pagoda style architecture that defines them. These architectures can be seen with religious inscriptions all over the designs. One of the highlights include the Durbar Squares. Kathmandu and Patan each have Durbar Squares that were once a palace for the ruling dynasties of the respective cities. These Durbar Squares have many temples and shrines in their premise.These include Kumari Ghar, Kaal Bhairab Mandir, Seto Bhairab Mandir, Hanuman Dhoka and Kasthamandap Temple in Kathmandu Durbar Square while in Patan Durbar Square there are Bhimsen Temple, Krishna Mandir, Golden Temple and many more. Swayambhunath Temple is one of the most important UNESCO world heritage site that sees influx of both Buddhist and Hindu Pilgrims. The sheer height of Swayambhunath stupa towers over the entire valley while the Buddha eyes radiate calm and majestic energy. 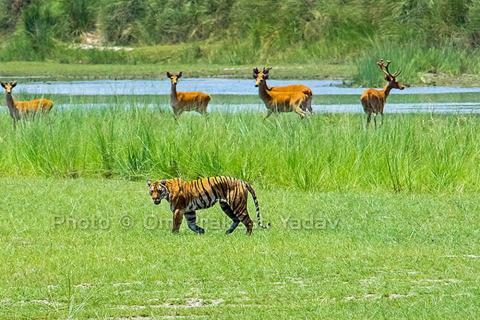 Established in 1973 A.D. Chitwan National Park is the first and the oldest National Park of Nepal. The park is famous for its Eco diversity among many flora and fauna found in here.Highlights of the park include the Bengal Tiger, One-horned Rhinoceros and Rock Python. 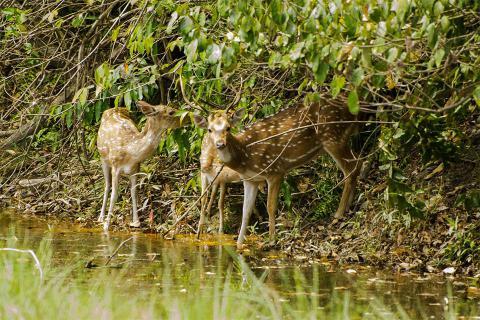 These rare animals have been protected by the combined effort of both locals and park officials. 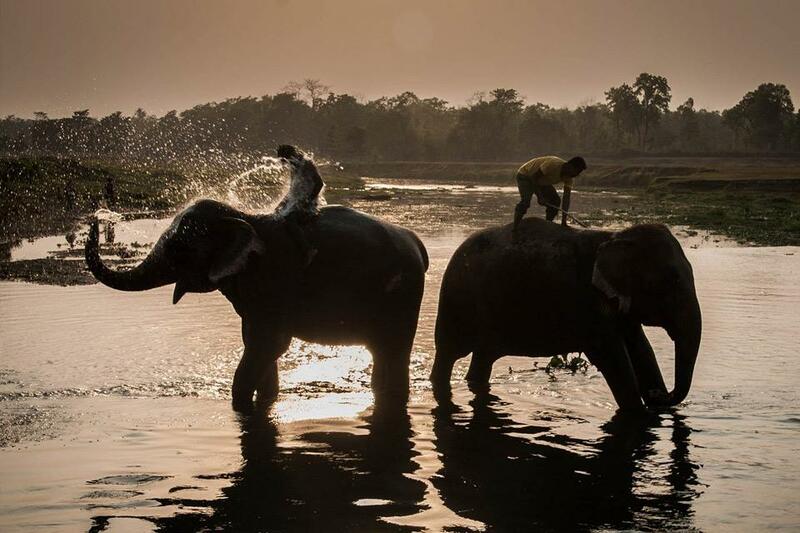 With hotels and lodges nearby the safari in Chitwan National Park is made even more easy. The park is famous for its elephant ride safari that are slow and steady with the view of the horizon. The safari can also be experienced via jeep. The activities in the park include canoeing, jungle walks as well as a visit to the Elephant breeding center. Upon your arrival in the airport, you will be met by our representatives who will drop us off to the hotel. After you check in and refresh yourself, we may take a walk around the Thamel area. In the evening, there will be a traditional Nepali dinner served by us as a welcome gesture. Today we explore both Kathmandu City and Patan City.We will explore first the Durbar Squares of the respective cities. While at that we explore many temples, landmarks and shrines located there. While in Kathmandu we also visit Swayambhunath Temple. After breakfast we leave for Chitwan via flight. Once in Chitwan you will be transferred to your hotel and after lunch we visit Tharu Cultural Museum. In the evening we walk around Sauraha during sunset. Today we spend our day at Chitwan National Park. After breakfast we go for walk around the park or go canoeing. We also visit the elephant breeding center. After lunch we continue our activities with an Elephant Jungle Safari or by Jeep Safari. In the evening we go for a walk in a nearby Tharu Village in Sauraha. Early morning, we go on a bird watching tour. We return for breakfast before leaving for Kathmandu. In Kathmandu you are free to enjoy your time until departure. Now our Chitwan National Park and Kathmandu heritage tour in Nepal comes to an end today. Approximately 3 hours befor your scheduled flight, you will be transferred to the airport by one of our representatives, from where you will depart. Kathmandu to Bharatpur and back to Kathmandu by flight. Accommodation on Twin/double sharing basis on Resort or similar for 2Nights at Chitwan.